NSL Consolidated (ASX:NSL) has just done what BHP, Rio Tinto and Brazil’s Vale have so far tried and failed to do. 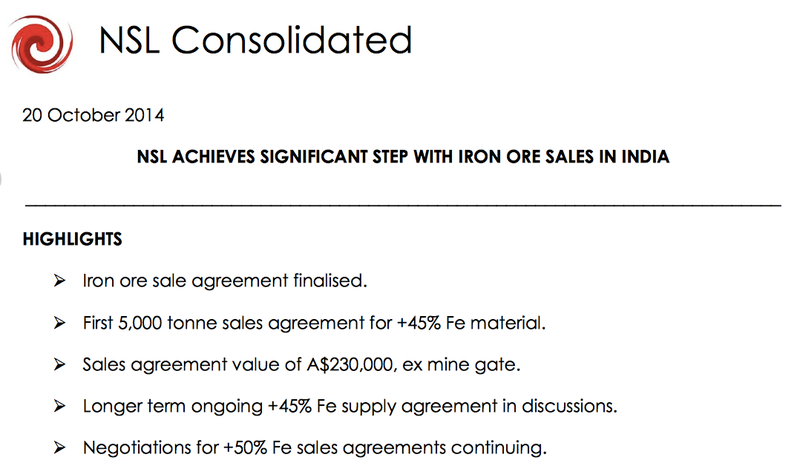 It’s sold Indian iron ore from its own mining and processing operation in the country – 5,000 tonnes of +45% Fe at an ex mine gate price of $46 a tonne... That’s $230,000 straight to NSL – paid upfront. The company has hit a significant milestone – now a producer and generating revenue from iron ore sales. But it’s just the start for NSL – they still have stockpiles of iron ore sitting at their mines, ready to be sold into a hungry domestic market. The next production milestone will be 7,000 tonnes/month of saleable material, ramping up to 200,000 tonnes/year... revenue could be in the millions of dollars per year in the near term. NSL have timed their run into India well and are now in pole position to cash in. They are the only foreign company selling iron ore in a 150 million tonne domestic iron ore industry, which sells directly in the world’s 4 th largest steel industry – set to triple in size in the next 10 years . Forget the seaborne price and negative global sentiment – India’s domestic iron ore industry sets its own price and the local thirst for iron ore is going through the roof thanks to Indian government efforts to stoke up the country’s heavy industries. 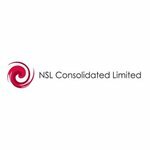 Now NSL has achieved its first sale we reckon more will surely come – NSL is in negotiations to sell 50-55% Fe iron ore to other parties and this first successful sale could well push those talks in the right direction. We first invested as a long term hold in the $7M market capped NSL back in August and covered the company’s plans for India in great depth with the article Tiny Miner’s First Sales Days Away: Stockpiles Waiting to Be Processed, Delivering Instant Cash Flow . Those stockpiles of iron ore came from trial mining conducted at its main iron ore lease in the state of Andhra Pradesh – one of three mines it owns in the region. Basically, the stockpiles are low-grade material that major Indian producers ignore. But NSL has a secret weapon – dry and wet beneficiation – a process that turns low-grade mined iron material into very sellable high-grade material – with a grade of 50% Fe and above in India. No one else does this – and it’s NSL’s ticket to carving off a big slice of the Indian iron ore market. In September, NSL hit the start button for dry beneficiation and we covered the company again with the article NSL Now Producing: Imminent Sale of Stockpiles . There are 200,000 tonnes of feedstock at NSL’s AP23 mine ready to go. The plan is to transport it to the nearby beneficiation plant at the NSL stockyard that’s now fully operational, process it and sell it. Using this quick cash flow, NSL plan to get a wet beneficiation plant online too and double its production rate. 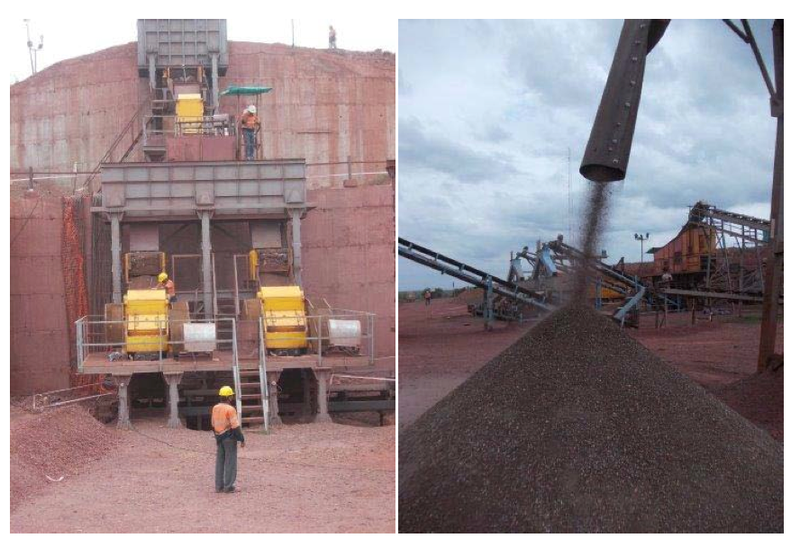 After that, NSL can mine its iron ore leases and put coarse grained, Run of Mine (ROM) material through the beneficiation plants – which can be paid for and expanded with quick cash flow from the feedstock. A very neat plan that’s coming together. NSL has its first $230k paying customer with likely more to follow... In this article we’re going to run you through all the particulars of the deal and cast a look ahead at the further sales and iron ore development NSL has in the pipeline. NSL hasn’t yet named the first customer for its Indian iron ore but we do know the details of this landmark deal . It works like this – a buyer has requested 5,000 tonnes of +45% Fe material at $46 a tonne – a sales agreement worth $230,000 AUD. The buyer will pay in advance and take delivery in tranches at the mine gate. The lifting of the iron ore from the stockpiles will take place after the Diwali holiday on October 23 rd . It would seem this is a test of NSL’s capabilities – a taste of things to come – because the same buyer is in discussions for ongoing supply of material from NSL at the same +45% Fe grade and a higher +50% Fe grade. That’s regular work – and if that gets sewn up then NSL could increase its beneficiation plant’s yield even further. This is a significant milestone for NSL. It has the mines and the processing plant and now it has its first sale. The Diwali festival in India signifies the triumph of light over dark – and when the work to deliver NSL’s first deliveries begins at the conclusion of this holiday the company will be marking a new beginning. In addition to the buyer that is already taking 5,000 tonnes from NSL, the company says it’s also in negotiations with several other buyers. These parties are interested in Fe grades of between 50 and 55% – high-grade stuff – which suggests they are also domestic Indian buyers. And NSL is well positioned to meet their needs – it has huge stockpiles of saleable iron ore, mines already producing material and a dry beneficiation plant up and running. Testing of NSL’s beneficiation plant and mining operations predicts the company can provide 25,000 tonnes of ROM material a month that can be turned into 7,000 tonnes of saleable, high grade material every month. This could generate NSL positive cash flows of millions of dollars a year as operations expand. Further sales of this material will greatly accelerate NSL’s plans to set up a stand-alone dry beneficiation plant at the AP23 mining lease and expand the existing facility at its stockyard. So if NSL can sew up even more iron ore supply deals for India’s domestic market, all of its grand designs will not only fall into place, they could rapidly expand. This is a real milestone for NSL – the first sale of hopefully many more. After more than five years of hard yakka, learning all the ins and outs of doing business in India, and establishing key relationships, the team has achieved the company’s first sale -with potential for more to come with the same buyer and negotiations with a number of other interested parties. You’d think they’d pause for a Gin and Tonic or two but no – NSL has got its foot on the accelerator. 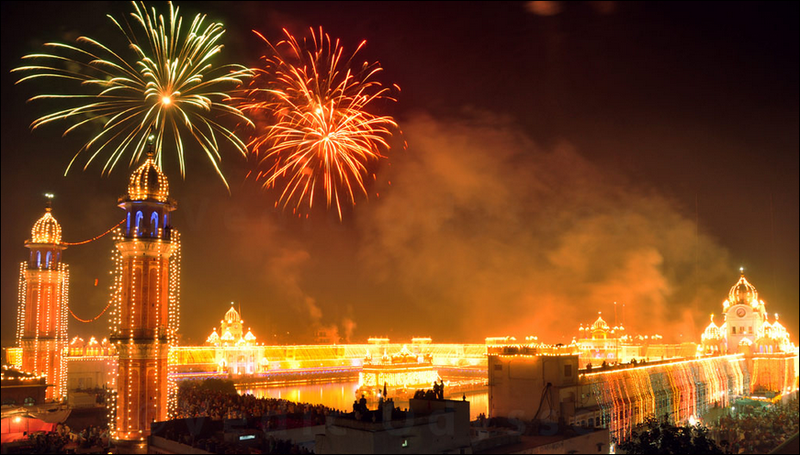 When the festival of Diwali is finished after October 23 rd it will begin fulfilling the first tranche of its order for 5,000 tonnes – and of course we look forward to seeing the $230,000 payment hit the company’s bank account. Next up of course are the negotiations with the buyer for ongoing supply of +45% Fe material and +50 Fe material. We’re also awaiting news of how negotiations go with the other interested parties. The thing to remember is that NSL is breaking new ground in India. No one else does what it does – take low-grade material, run it through beneficiation and make it into high grade material. As the Indian steel industry is set to triple in the coming decade, NSL has made its first iron ore sale and is now earning cash – a rather good position to be in.